As we start the new school year, we might want to ponder these questions about our students’ modern language speaking. Will my students study the modern language or use the modern language more? Even beginning level students can have conversations if we structure class. Who needs more practice in speaking the target language – me or my students? If my students, then, how do I have them practice the language more in the classroom? If I want my students to converse in the modern language, how do I help them develop good skills in asking and answering questions? How can I move from a tennis classroom in which I serve a question or sentence to one student at a time to a soccer classroom in which all students participate at the same time so that students can speak more in the classroom? For how many minutes each classroom will my students converse? How many sentences do I want my students to use in their conversation? Four, six, eight, ten sentences or more at a time? How will I help to increase in the amount that they can say during a conversation? How will I help my students to go from memorizing sentences to spontaneously modifying memorized sentences to create their own personal meaning sentences? How fluent (in terms of sentences per minute) do I want my students to be in spontaneous speaking? 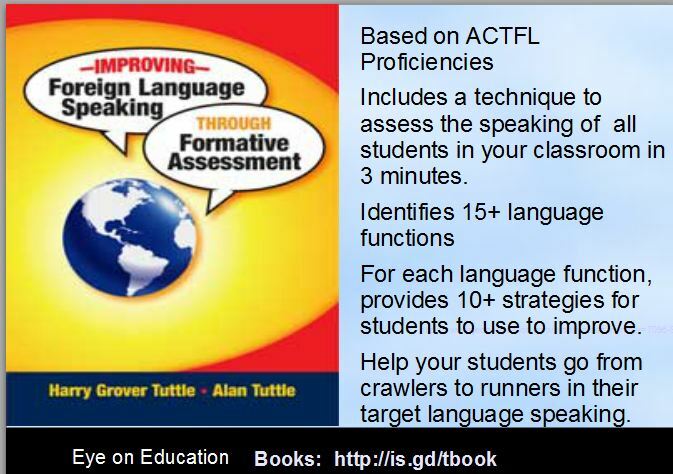 How do I structure my lessons for them to increase in their fluency? What type of reading should be on a modern language test? – Why is it more important for the students to translate than for them to use the modern language? – Cannot we teach them reading techniques to be able to read and answer in the modern language? – Why are we giving them a reading exercise that is harder than reading in the modern language? If they are answering questions in the modern language, they can look for the same or similar words in the passage to find the answer. If they are working in English, they have to translate the words into Spanish to find the answer. 1) Answer the question word. If the question word asks “How many…?, they look for a number. 2) Look for the answers in the passage in order. First find the answer to question one, then look for the answer to question, etc. If students know that the answer to question four follows the answer to question three, they can logically find the answer. 3) Look for the same words or similar words in the question and in the passage. The writer may use a synonym such as boy for youth. If the question asks, “When did he eat the hamburger?”, the reader can look for these words in the passage and, probably, if there are two or more of those words, find the answer. With these techniques, they can answer literal or factual questions very successfully. With more practice, they can answer higher level reading such as inference and interpretation with the language. Let’s move to in-language reading testing instead of translation reading. Let’s show our students that we believe they can read and understand in the modern language.